The 30' Balanced 1/4" TRS Male to 3-Pin XLR Male Audio Cable from Hosa Technology is a professional audio cable that's perfect for touring and live sound applications where a device with a balanced 1/4" phone output needs to be connected to a device with an XLR input. The cable has top-quality REAN connectors for excellent durability and superior signal transfer. The conductors are made from 24 AWG oxygen-free copper to maintain a clear signal path. The cable also has 90% OFC spiral shielding for terrific flexibility and effective EMI and RFI rejection. 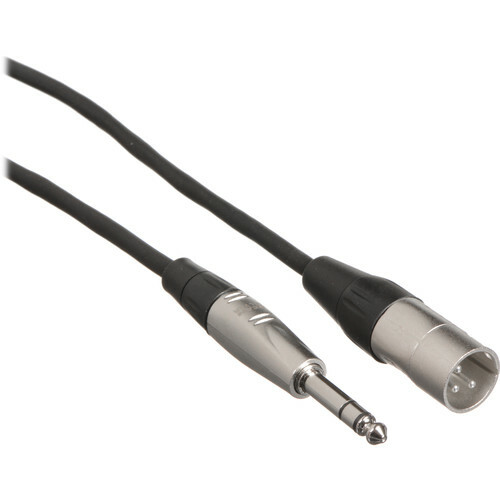 The cable is 30' long and has a 1/4" TRS phone connector at one end and a 3-pin XLR male connector at the other. Box Dimensions (LxWxH) 6.2 x 4.2 x 1.5"
Balanced 1/4" TRS Male to 3-Pin XLR Male Audio Cable (30') is rated 4.6 out of 5 by 5. Rated 4 out of 5 by Eugene from Works nicely Works nicely to provide balanced output from my mixer to my PA speakers. Rated 5 out of 5 by PHiLDOGGiE DOGZ from Does the job!!! I use them to connect my serato mixer to my JBL's. sounds great!!! Rated 4 out of 5 by Mix Ave from Don't think cheaps don't work Excellent product. Very proffessional people. Rated 5 out of 5 by Eagle from Works Great Just like it is supposed to.